I was desperate for a fresh tasting and healthy Asian dish the other night, so I was pretty pumped when I found this recipe. It was so delicious that I ate more than I should have, but I couldn’t help it (not to mention I was starving). My only word of caution with this recipe is the vinaigrette kind of absorbs into the noodles when saved. While this was decent packed in my lunch the next day, I was kind of sad that the flavors had melded together. My advice would be if you know you’re going to have leftovers, toss each serving individually in a portion of the vinaigrette only when ready to serve. Other than that, this dish was really yummy and I have no complaints! Cook noodles in boiling water for 7 minutes or until almost al dente. 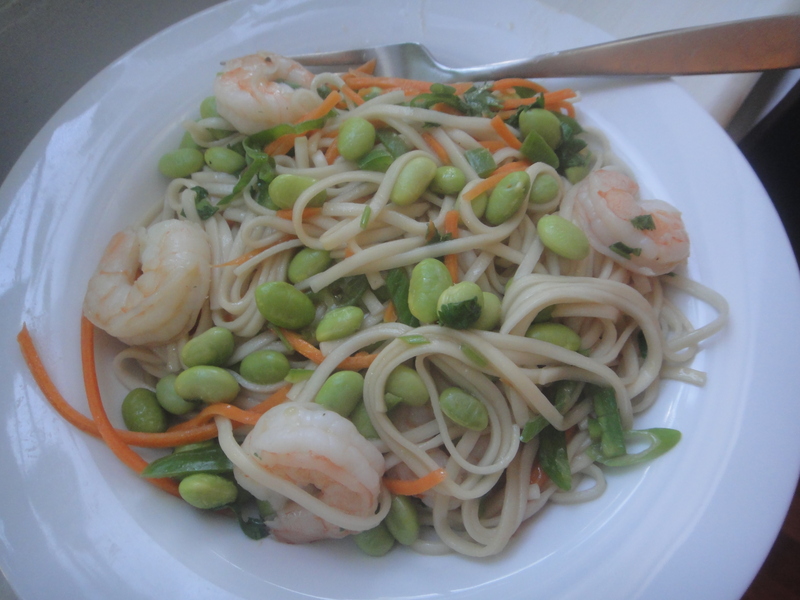 Add frozen edamame to pan; cook 1 minutes or until thoroughly heated. Drain. Place noodle mixture in a large bowl. Add carrots, onions, cilantro, and chile; toss. What a fresh, light and super tasty meal idea. I’m getting way too hungry looking at food blogs today!